"But I don't look like those women in the photos on Instagram." "I'll never be that gorgeous in labour." "That is not how I'll appear after having a baby." "What if my birth is boring?" "What if labour moves slowly?" My response - I want to document your birth as it unfolds. Your birth story is beautiful. Birth photography is more than the big moments. It is more than the images that go viral online. I want to notice the little details that make your story yours. I want to capture the little nuances between you and your birth partner that tell your love story. I will observe quietly, pick up my camera when the moments are there and hopefully you won't even notice I've clicked the shutter. Dad gazing at Mom lovingly while he gently wipes her forehead in labour. Birth is a love story. 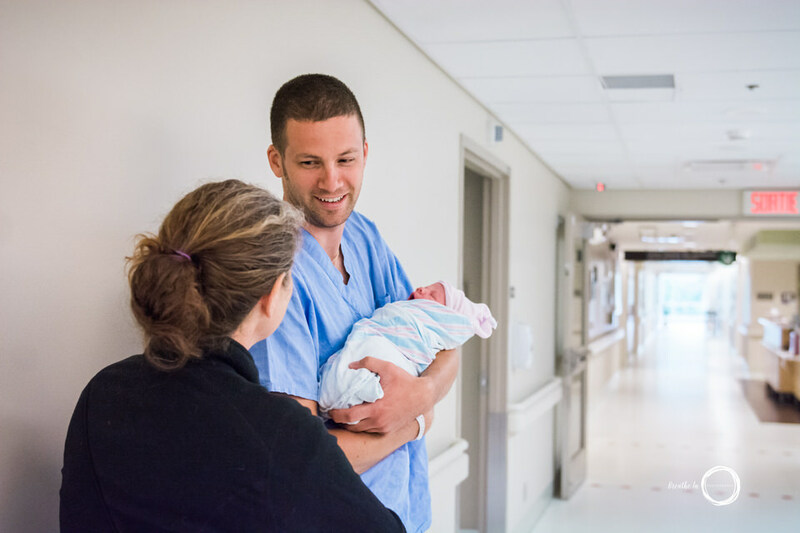 My job is to collect the photos that will illustrate the day your baby is born, your love story, your baby's first moments as they get to know you and as you take them in. As a birth photographer, I am not looking to capture the next viral image. I'm not hoping to capture "the shot" that will be published by Huffington Post. My focus is your story. I believe, some of the most incredible, moving, breath-taking images are the ones that may seem ordinary to some. But - in those images - there are the details that only you know -and I hope they will remind you of the day your baby was born for years and years. These are the photos I love to capture. I'll never know what words were being exchanged or shared between this wonderful doula and this family - I don't need to. I believe images like this tell the story and I hope when the families look back at them - they will remember the details of these moments. These images matter. The way the doula is holding Mom's hands, the laughter, the warmth, the obvious respect and honour between them. These photos unlikely go viral - but they mean more to me as a birth photographer because they capture this family - and that is my job. This is what I love about this work. I love the following two images so much. Do you know these emotions in labour? Did your well-meaning birth partner try to make you laugh at the wrong times? His lovingly-intentioned joke? - this is how they love each other. The setting is captured on purpose. Notice the crumbling drain pieces on the corner of the tub? THAT is part of their birth story. Their unique problem solving skills. These ordinary details make the narrative. How is that water staying in the tub? We'll never know - but they do. This is the position this pair was in for a long time - alternating between Dad and Doula - this is birth. I hope images like this will bring you back to the words of support, your strength and your perseverance. The green pink-tulip-adorned plastic table cloth from the Dollar Store, Dad's hands as he gazes down at baby, baby's wrinkly fresh-born puffy eyes, Mom resting, the chaos of the towels, blankets, chuck pads and housecoat. Only the family will know what is what in these images - but they will know and they will remember. I think these ordinary details are so beautiful and I will capture them at your birth. These kinds of photos make my heart full - these are the ones I LOVE. When I realized I wanted to be a birth photographer it felt right for so many reasons. A big reason is that I love documenting ordinary moments - because it's in the space between those moments that we find our unique experiences. I'll capture the moments on camera, you tell the story. Your birth story is beautiful. You take care of each other and I will take care of the photos.